Reporter Donna Beth Weilenman’s excellent coverage of the upcoming Call To Action community meeting, Monday, March 10 at 7pm in the Benicia Library’s Dona Benicia Room. A MEETING of residents opposed to Valero’s proposal to bring crude oil by rail to its Benicia refinery will be held March 10. An organization of Benicia residents and business owners will meet March 10 to air their concerns about the proposed Crude-by-Rail Project that would substitute rail cars for oceanic tanker ships in bringing crude oil into the Valero Benicia Refinery. The project, which is undergoing environmental analysis, would allow the company, which owns no oil wells, to bring crude oil from domestic sources to the local refinery via Union Pacific Railroad tanker cars. “A group of Benicia residents have formed an opposition group, Benicians for a Safe and Healthy Community, to give voice to serious concerns and questions as the city considers Valero’s proposal,” said Andres Soto, organizer with Oakland-based nonprofit Communities for a Better Environment. Founded in 1978, CBE focuses on preventing and reducing pollution and promoting environmental sustainability in minority and low-income communities through educational, legal and technical assistance, according to its website. Those attending the open meeting in Benicia Public Library will see a video presentation and hear a panel of Bay Area individuals talking about the Valero project, Soto said. Afterward, the audience will be divided into groups, in which they may ask questions and receive answers and begin to make plans for future activities. The group has called the Bakken shale crude and diluted tar sand bitumen “the last gasp of a dying fossil fuel industry,” and challenged Valero’s contention that safety measures would be in place, including the use of the refinery’s own fire department, which Valero has said would join other emergency agencies to respond to accidents. In addition, group members worry that rail car operations would cause minor vapor emissions as well as intentional crude oil venting, causing a greater impact on the environment than oil tanker or pipeline deliveries. Benicians for a Safe and Healthy Community also discounts Valero’s contention that the project would provide many jobs outside its short-term construction. “But there is absolutely no financial gain for Benicia,” the group argues. Furthermore, the group argues that neither Valero nor the city are acknowledging crude-by-rail proposals at other Bay Area refineries and their cumulative effects, nor the health and safety of other communities through which these trains would pass. Valero’s application, originally submitted in December 2012, proposes extending the Union Pacific tracks by a quarter mile to bring in 70,000 barrels of crude each day by train. This wouldn’t be additional crude to process; rather, the refinery would reduce by the same amount the crude it receives by ship, the application said. The application, some related documents and lists of others can be viewed on the city website. While opponents have expressed worries about emissions associated with the off-loading of the crude oil, the applicant and a railroad company spokesperson have said greenhouse gas emissions would be reduced through shipment by rail. He also has touted the company’s safety record. Regarding emissions related to the project, the Bay Area Air Quality Management District must approve the project, and refinery officials have promised to document any changes in air pollution. This is not Valero’s first attempt to substitute rail cars for oceanic tankers. Bill Day, Valero Energy’s director of corporate communications, said the refining company has been sending North Dakota crude to Louisiana at a rate of 40,000 barrels a day, after which it is delivered by pipeline to Memphis, Tenn.
“That North American crude is being produced in areas that don’t have a lot of pipeline infrastructure yet, so rail is currently the most efficient way to get it to refineries for processing,” Day said. In fact, domestic crude oil production may reach 8.5 million barrels a day by the end of this year, an increase from 5 million barrels a day in 2008. Most of the increase has come from fracking operations in the Bakken fields, primarily in North Dakota, as well as in Montana and farther north in Canada. Rail delivery increased from 9,500 carloads in 2008 to 415,000 carloads in 2013, according to industry calculations. However, several crude oil trains have recently experienced highly publicized derailments, some with tragic consequences. In Lac-Megantic, Quebec, Canada, where one train rolled down a hill before slipping off the tracks, the resulting explosion and fire killed 47 people and destroyed 30 buildings in the center of the city. Several other derailments in the United States caused fires and spills, including in Casselton, N.D., where a conflagration burned more than 24 hours, though no one was reported hurt or killed. While the U.S. Department of Transportation is working on stiffer rules about crude transport, some rail companies have chosen not to wait, instituting their own increased safety measures. In the U.S., Burlington Northern Santa Fe (BNSF) is the largest train carrier of crude oil. The company announced last month it is voluntarily seeking bids on 5,000 stronger tanker cars specifically for carrying crude oil. In Canada, both Canadian National and Canadian Pacific have announced increased charges to ship oil in older tanks, and the CEO of Canadian Pacific, Hunter Harrison, has called for the older cars to be removed from crude oil service. However, the board noted that federal authorities didn’t initiate a new regulation process until 2011. The person in charge of the Department of Transportation’s Pipeline and Hazardous Materials Safety Administration, Cynthia Quarterman, has told the board new rules may be written by the end of the year, but couldn’t say when they’d become effective, because the White House must examine them first. The NTSB has questioned whether upgraded oil cars are strong enough for the job of carrying the sweeter domestic crude, which has a lower ignition point than “sour” Canadian tar sands oil. The new BNSF cars, designed to that company’s specifications, have been described as stronger than those being discussed by the Department of Transportation. Meanwhile, a voluntary agreement has been reached to address oil train safety, though Kevin Thompson, speaking for the Federal Railroad Administration (FRA), said the pact to increase track and mechanical inspections and to use better brakes was just one step in a larger effort to improve crude-by-rail safety. In a statement to the U.S. House of Representatives Subcommittee on Railroads, Pipelines and Hazardous Materials, FRA Administrator Joseph C. Szabo wrote that train accidents, derailments and grade crossing accidents have declined significantly since 2004, despite intermodal freight traffic approaching record-level increases. Szabo wrote that the FRA is monitoring crude-by-rail shipments, particularly from North Dakota, where accidents have declined in the past three years. However, after the recent train accidents in the U.S. and Canada, Szabo wrote that the U.S. Department of Transportation, the FRA and the Pipeline and Hazardous Materials Safety Administration (PHMSA) have been taking steps in several areas to reduce risks and assure safe fuel transport — of ethanol and other products, not just crude oil. He wrote that industry representatives, rail company chiefs and those from the FRA, the Federal Motor Carrier Safety Administration and PHMSA met Jan. 16 for a “call to action” to develop specific plans to immediately improve crude-by-rail shipments. In addition, Szabo wrote, they were asked to look at more long-term solutions. He wrote that tanker cars are just one link in the delivery chain. “We must identify and evaluate all of the risks associated with bulk movement of hazardous materials, such as ethanol and crude oil, and then work to eliminate those risks,” he wrote. In addition, he announced the start of an investigation, including unannounced inspections, into how shippers and carriers classify crude oil, particularly Bakken shipments. “As I have described, rail safety is at an all-time best,” Szabo wrote. He wrote that human error and track defects are involved in more than two-thirds of all train accidents, and trespassing and highway-rail grade crossing accidents are connected with 95 percent of rail fatalities. He wrote that positive train control systems, or PTS, would prevent speeding derailments, train-to-train crashes and several other types of accidents. Other milestones Szabo announced were formal programs for train conductor certification and employee and contractor training; enhanced safety rules; reduction in electronic device distraction; improved track inspection, including assurances that rail inspectors are qualified; and the introduction of new technology to prevent track buckling. Standards for better railroad grade crossings in 10 states, part of a five-year plan to improve and audit grade crossings and programs to identify situations that could lead to train accidents, also have been introduced, he wrote, and President Barack Obama’s budget calls for developing a coordinated approach to enhance America’s rail system, both for passengers and freight delivery. Benicians for a Safe and Healthy Community’s forum on the Valero Crude-by-Rail Project will take place at 7 p.m. Monday, March 10, in the Doña Benicia Room of Benicia Public Library, 150 East L St.
17 minute interview of Marilaine Savard by Andrés Soto of KPFA Radio. Dramatic photos. Ms. Savard is the spokesperson for a citizens’ group in the region of Lac-Mégantic, Québec. Last year, a string of exploding petroleum rail cars destroyed the center of the town and claimed 47 lives…. In partnership with: Sierra Club, 350 Bay Area, Communities for a Better Environment, Richmond Progressive Alliance, ForestEthics, Pittsburg Defense Council, Pittsburg Ethics Council, Benicians for a Safe and Healthy Community, and the Crockett-Rodeo-Hercules Working Group. WASHINGTON (AP) — Rail tank cars being used to ship crude oil from North Dakota’s Bakken region are an “unacceptable public risk,” and even cars voluntarily upgraded by the industry may not be sufficient, a member of the National Transportation Safety Board said Wednesday. The cars, known as DOT-111s, were involved in derailments of oil trains in Casselton, N.D., and Lac-Megantic, Quebec, just across the U.S. border, NTSB member Robert Sumwalt told a House Transportation subcommittee hearing. Forty-seven people were killed and 30 buildings destroyed in the blaze ignited by the Lac-Megantic accident. The Casselton accident, which occurred half a mile outside the town, created a massive fire that burned for more than 24 hours. The NTSB has been urging replacing or retrofitting the tank cars since 1991, but the most recent federal effort to write tougher regulations for new cars didn’t get underway until 2011. An initial public comment period closed in December, and regulators are currently at work writing proposed new standards, Cynthia Quarterman, head of the Transportation Department’s Pipeline and Hazardous Materials Safety Administration, told the panel. She said she expects her agency to propose new tank car standards before the end of this year, but refused to be pinned down under questioning by lawmakers on when those rules might become final. “Right now, there is so much uncertainty that people aren’t going to make investments in safer cars and they’re going to keep running these crummy cars and killing people,” Rep. Peter DeFazio, D-Ore., complained. Quarterman said she expected her staff to finish writing proposed rules “very soon.” All major regulations go to the White House before they are issued to ensure the safety benefits outweigh the cost to industry. It often takes months to years between when new rules are proposed and when they become final. 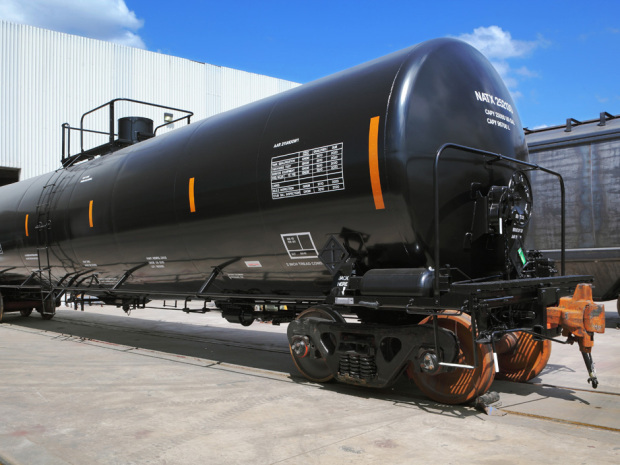 Ed Hamberger, president and CEO of the Association of American Railroads, said the industry has strongly urged the government to set new tank car standards. “We believe there needs to be a safer tank car,” he said. At least one major freight railroad has given up waiting. Last week, BNSF invited bids from manufacturers for 5,000 new tank cars made to new specifications that the company has developed. The aim is to make these latest tank cars safer than the voluntarily upgraded tank cars that the NTSB has questioned as possibly not safe enough. The NTSB has said vulnerabilities with the DOT-111s means they are easily ruptured during accidents, releasing crude oil or other hazardous liquids like ethanol that then ignites. U.S. crude oil production is forecast to reach 8.5 million barrels a day by the end of 2014, up from 5 million barrels a day in 2008. The increase is overwhelmingly due to the fracking boom in the Bakken region, which is mainly in North Dakota, but also extends into parts of Montana and Canada. U.S. freight railroads transported about 415,000 carloads of crude in 2013, up from just 9,500 in 2008, according to government and industry figures. The oil trains, some of which are 100 cars long, pass through or near scores of cities and towns. Sen. Chuck Schumer, D-N.Y, called on the freight rail industry and the Transportation Department to amend a voluntary agreement reached last week to address oil train safety concerns. He said the agreement should be changed to require industry to develop a plan no later than July 1 to phase out or retrofit the DOT-111s. “Each week seems to come with another freight train derailment, and it is imperative we undertake every measure necessary to ensure the safety of our nation’s communities through which these crude oil tank cars pass,” he said in a statement. Kevin Thompson, spokesman for the Federal Railroad Administration, said the agreement was just one step in ongoing efforts to improve the safety of crude oil shipments by rail. “All communities will see a reduced risk of derailments because of increased track and mechanical inspections and the use of enhanced braking technology” under the safety agreement, Thompson said.